Xuereb, S. Sillato, C. Gafa, F. Mumford, M.P. Mumford, J. Rapa (M. Buttigieg), E. Cordina, D. Bellotti, F. Zeqiri, J. Buttigieg, C. Portelli (J. Mifsud). Brignoli, S. Sultana, C. Borg (A. Xiberras), C. Cauchi, C. Azzopardi, J. Grima, D. Micallef, C. Farrugia (R. Zammit), L. Buttigieg (J. Theuma), F. Kosova, M. Zerafa. St Lawrence Spurs returned to winning ways in their match against Qala Saints and with the points obtained the Spurs moved over the same Qala on the table. Qala were coming from four consecutive wins and were favourites to obtain a victory to complete a comeback and consolidate their ambition to be among the challengers for promotion. On the other hand St Lawrence only managed to earn in point form their previous matches and moreover in this match they ended with a player less on the field just after the half hour mark. The match tuned out into a well contested encounter where Qala produced pressure on St Lawrence’s rearguard during the second period but the Maroons failed to capitalize from the extras player on the field. The Spurs seemed determined to defend the positive result and also managed to clinch the win with a last-gasp goal that arrived against the run of play. Play was rather balanced during the openings stages of the encounter. St Lawrence were dangerous on 5 minutes through a shot by Franco Kosova following a pass by Chris Borg that ended just wide and on 18 minutes Qala replied with a direct free kick by Michael Mumford that ended over the crossbar. On 30 minutes the Spurs ended with a player less when Michael Zerafa was sent off for abusive language. St Lawrence however went close to scoring on 39 minutes but an effort by Christopher Cauchi was deflected to a corner by the defense. Qala replied two minutes later through a header by Joseph Buttigieg following a corner kick by Christian Portelli that was deflected to another corner by the defense and just before half time Qala’s Fatos Zeqiri had a shot on the run that missed the target. The Spurs once again threatened Qala’s rearguard on 49 minutes through a strike by Charlon Farrugia from a good position that ended wide and two minutes later Qala’s Michael Mumford had a direct free kick that got a deflection but goalie Angelo Brignoli recovered his position and saved the danger. On 62 minutes St Lawrence’s keeper Angelo Brignoli was well placed to save another free kick by Michael Mumford and the same goalkeeper was called again to make a difficult save on 68 minutes to block an attempt by Qala’s Fatos Zeqiri. Qala increased their pressure on St Lawrence’s defense and on 72 minutes goalie Angelo Brignoli saved with some difficulty a good attempt by Qala’s Dylan Bellotti. The same striker had a good header less than a minute later but St Lawrence’s keeper was again at the right position to block the danger. As time passed by St Lawrence managed to resist to Qala’s play and goalie Angelo Brignoli was not called to make difficult saves. 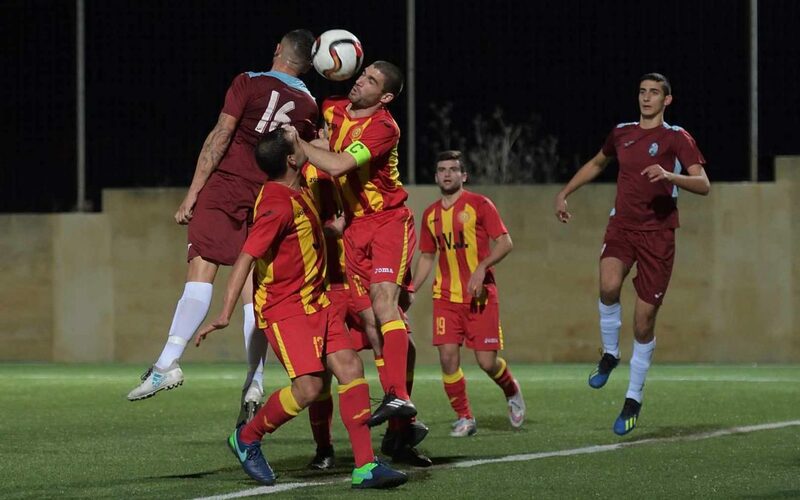 During stoppage time St Lawrence took full advantage of open space within Qala’s territory and in the fourth minute of stoppage time the Spurs had a close ranged attempt by substitute Reuben Zammit following a cross by the other substitute Jason Theuma that was blocked by goalie Omar Xuereb. However, St Lawrence scored the goal that decided the issue one minute later when Franci Kosova entered Qal’s territory in a counter break and netted with alow drive as the goalkeeper left his position in an attempt to block the danger.